This widget changes the Favicon, which is the little image at the top of your browser next to your page’s title. Your visitors will also see this icon if they bookmark your site. We recommend that you put this widget in the header or footer so that it appears on every page. Keep it simple. Your icon will be scaled down in most situations. Keep your design simple, so it’s recognizable at a small size. 32px × 32px. So it looks good on retina displays, your favicon should be 32px × 32px. .ico or .png. 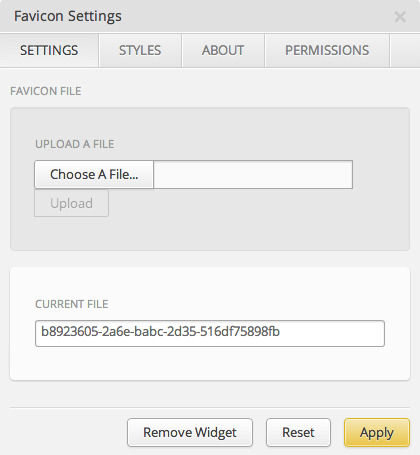 If you’re using an icon creator (like Icon Slate), then save your favicon as an .ico. If you’re using a standard image editor (like Pixlr), then save your favicon as a .png.